Venison is one of those meats that "traditional" cooks seem to sway away from. First of all, it is rare you see it in a store to purchase, since it needs to be farm-raised and processed in an approved FDA facility in order to be sold to the public. Sure, sometimes it is seen on an upscale restaurant menu, but you can bet it may have come as far away as New Zealand before it makes it to your $45 platter. And then there is the scuttlebutt that it is hard to cook, since it is a very lean hunk of meat. Do I add bacon to put some fat in the saute pan? Will it taste gamey when I'm done? 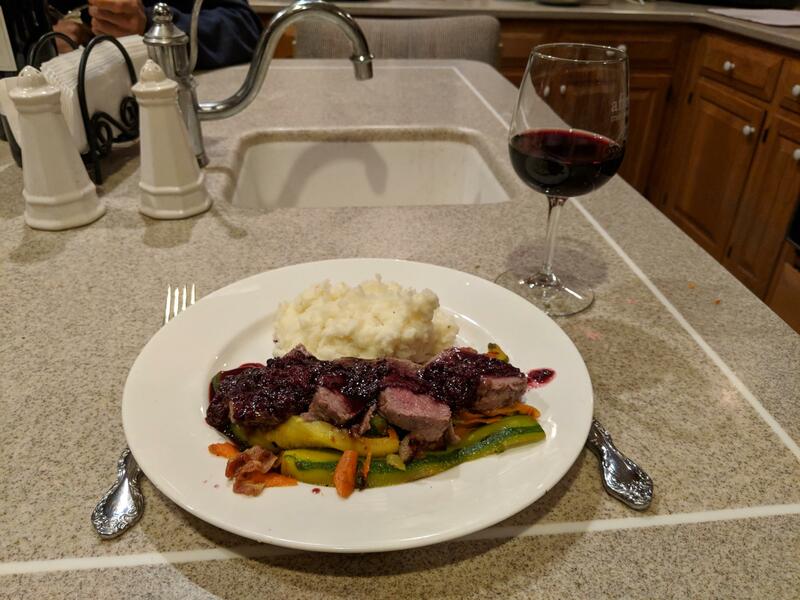 Certainly these things are of consideration, but having a spouse that wears camouflage part of the year can have it's advantages (assuming they are a good shot) if you remember only two rules when cooking venison. First, remove all of the silverskin, which is a major contributor to that gamey taste you can't stand. Second, never over-cook venison; medium-rare to medium should be your target temperature. One of the good things about venison as your main course is that it is the King of the Show, so you don't need anything fancy to add to it. Popular sides can be as easy as mashed potatoes with blanched green beans, or wild rice with an assortment of Fall vegetables. For our meal I did mashed with thinly cut zucchini and carrots. The one thing I can suggest to you is to have your sides well underway before you get going on cooking the venison. Unless you're doing a roast, it will cook very fast and will catch you off guard if your aren't near ready to plate. For this recipe I started with a 24" long tenderloin (12" is all you need for 3 people). I also made a blackberry sauce to go with it, which, when paired with a bold Petit Verdot, put me in second heaven. 3. place in a pre-heated 375 degree oven and assume about 20 minutes of cook time. 4. for the sauce, combine the balsamic, beef stock, jam and garlic in a sauce pan and bring to boil. 5. add blackberries, stirring to incorporate, and reduce the fluids to about half or until you get a consistency to your liking. 6. when the alarm goes off, remove the cooked loin and let it rest, watching the temperature continue to climb to around 130 degrees. During this time complete all the sides and the sauce, and plate them. 7. Cut the loin cross-wise into 1/2" slices and serve adjacent or across the top of your sides. Spoon the sauce over the meat. 8. Serve with a slightly chilled glass of Petit Verdot or a red Bordeaux favoring a Cabernet Sauvignon. 1. brush olive oil on the loin, salt & pepper to taste and place in an oven-proof dish. 2. Insert a digital thermometer probe with a cabled remote display, setting the alarm for 120 degrees.